Do you know about Science 360? If you are homeschooling (or even if you aren't!) 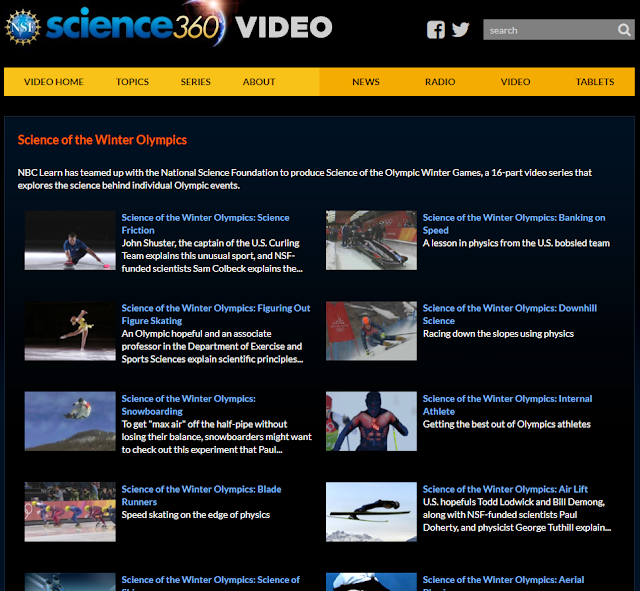 this site is a must, because the Science360 Video Library teaches viewers about the latest wonders of science, engineering, technology, and math. Created by the National Science Foundation (NSF), Science 360 shares the latest science videos provided by scientists, colleges and universities, science and engineering centers, the NSF, and more. And since I will be focusing on the Winter Olympics over the next week, I wanted to share with you this really good 16-part video series that explores the science behind individual Olympic events. NBC Learn has teamed up with the National Science Foundation to produce Science of the Olympic Winter Games. I'll be using it with my own kids as we focus the majority of our school time on the upcoming Olympics. It explores the science behind many of the individual sports. From physics to math, your kids will learn not only how science impacts the sports, but also how equipment must be designed to work perfectly with the athletes to give them the best competitive edge.